Residents in Kilanas was very lucky to have another mosque in the village. Though technically speaking the new mosque located at Bebatik Kilanas is a mosque for the Mukim and not for the village, but it does not matter, there are now two mosques in the village. Both are within 5 minutes drive from my house. Now I can hear the azan from both mosques but the new one is louder. HIS Majesty the Sultan and Yang Di-Pertuan of Brunei Darussalam yesterday joined hundreds of congregants in the first Friday prayers at a newly-completed mosque, named after the monarch's late mother, in Mukim Kilanas. 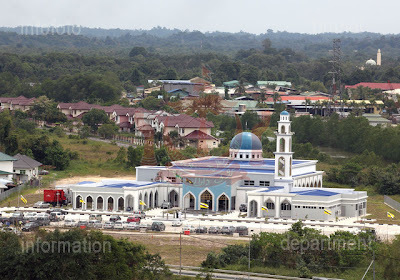 Brunei's newest mosque, Masjid Ash-Shaliheen is now open for use by the public. His Majesty consented to attend the first Friday prayer at the mosque on 13th July 2012 and signed a plaque. The mosque is located at Jalan Kumbang Pasang and is very near to the government's ministries and departments in the Jalan Menteri Besar area. The new Prime Minister's Office Building is very near the mosque. 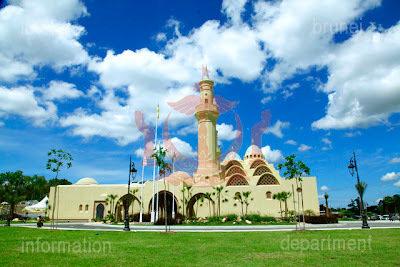 From what can be seen during the televised telecast of the Friday prayer at the mosque, the design of the mosque is different compared to other mosque in Brunei Darussalam. It is based on the Moorish Andalusia architecture. It is the first mosque to have a retractable roof. Siti Hajar of Borneo Bulletin wrote a very eloquent piece of the mosque, and I am attaching it here. All the photos are sourced from Borneo Bulletin and Information Department. 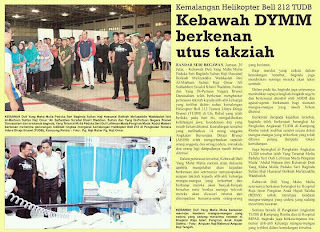 Yesterday afternoon, one of Royal Brunei Air Force helicopters, a Bell 212 crashed somewhere near Labi. By this morning, it was reported that 10 of the crew and passengers had died, two are injured and two still unaccounted for. In Facebook, a list of the names had been circulated but at that point in time, about half were still unaccounted for. His Majesty said it was a National Tragedy following close to last year's Bus Crash in Sabah which also killed several of our people. His Majesty had personally visited the hospital as well as the Royal Brunei Air Force base in Rimba. The Bell helicopters are from the No 1 Squadron which is equipped with both Bell 212 and Bell 214ST. The primary roles of No 1 Squadron are trooplift, casualty evacuation, medical evacuation, fire suppression, VVIP lift, search and rescue. The Bell helicopters had also dealt with bushfires in the past. 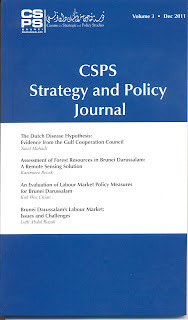 Brunei Darussalam's Labour Market: Issues and Challenges written by Lufti Abdul Razak, a PhD in economics candidate at Warwick University. This is the second set of photographs from His Majesty's 66th Birthday program book. 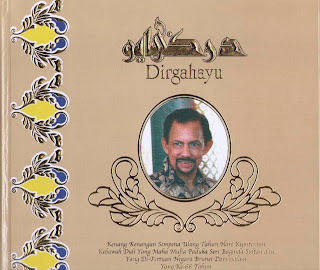 This one contains the six photographs of His Majesty's three brothers, HRH Prince Mohamed Bolkiah, HRH Prince Sufri Bolkiah, HRH Prince Jefri Bolkiah and their wives. Voice of America, Jul 13, 2012 - Move marks new chapter for three Arab countries which traditionally have been represented by male athletes only. I didn't know Brunei is an Arab country! When did we move? And when did our mostly Malay people suddenly became Arabic? To be fair, I did read the full article and in the article there was no mention of Brunei being an Arab state. So where did the news digest get 'the three Arab countries'? Someone obviously have not done their homework. Every year during His Majesty's Birthday, there will be two program books. One will be filled with all the activities that will be carried out from the morning of the birthday. The other one, a very much thicker volume and weighs around 2 kilograms (my best guess) is filled with photographs of the royal family and all the events in pictures and texts of everything that happened which involved His Majesty from the end of his previous birthday. This book is very popular as many people want to see the latest photographs of the members of the Royal Family. 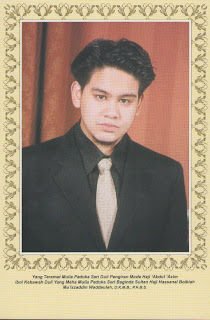 For the 2012 edition, there are 41 members and I thought that I will scan the photos and put them up here. I have been wanting to do this many times previously but I just never got round to scanning the various photographs. When you attend someone's birthday party, it is customary to bring a birthday gift. However there is someone's birthday party that you do not have to bring a gift. In fact you will get one or in this case several gifts. On Sunday, 15th July 2012, His Majesty will be awarding a number of deserving people with Orders and Decorations. 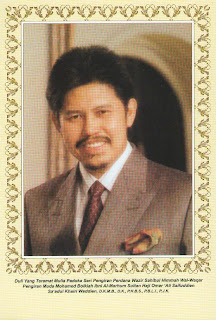 I have written about this in the past, here is one which I did in 2010 about Brunei's Orders and Decorations. There are still many people who do not know how the titles of Pengiran Cheterias or Pehin Menteris are awarded. 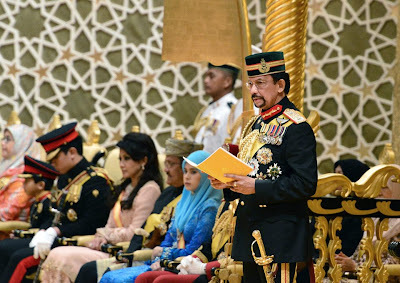 Some even confusing them with the awards of Orders and Decorations handed out annually by His Majesty The Sultan and Yang Di-Pertuan of Brunei Darussalam during his Birthday Celebrations. Many confused them with the Malaysian system. Someone asked me the other day that how come our Deputy Minister of Culture, Youth and Sports in her statement at the recent APEC Forum on Women in St Petersburg, Russia stated that Brunei women ranked 3rd highest in the world in terms of pay. He said that he thought there will be other countries earning more and that women in Brunei may not be earning that high as there is not enough of them in the top echelon either in government or private sector. He asked me to clarify as I was at the Forum too. What the Deputy Minister said in St Petersburg was this: "In terms of female receiving equal pay, the global gender report, Brunei Darussalam ranks twenty-ninth (29th) and in Estimated Earned Income we rank third (3rd) in the world." 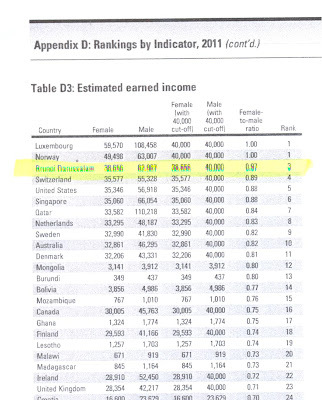 The Brunei Times headlined the news "Brunei women third highest paid in the world" on 4th July 2012. The last I checked the internet, this headline went round the world. 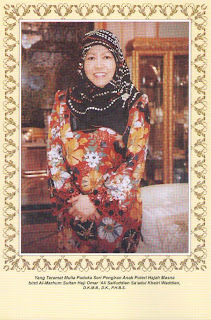 This is the final three of the nine postcard set issued by the Brunei National Archives. 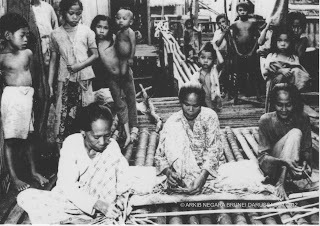 These are photographs of Brunei taken from the 1940s to 1970s. 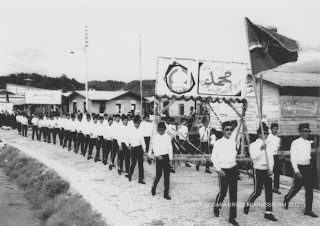 The Brunei National Archives recently released a set of nine postcards showing historical photographs of Brunei in its collection. Here is the second set of three postcards. 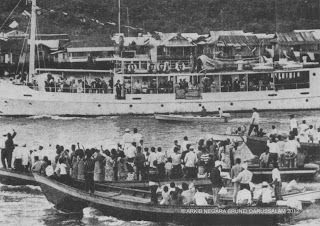 The Brunei National Archives recently launched a set of postcards consisting of historical photographs in its collection. The photographs are from the 1940s to 1970s. The publication of the postcards is aimed to promote The National Archives collection as a custodian of national and historical heritage as well as resource and research centre. There are altogether nine postcards in the collection. I don't know how much the whole set cost but it is not too expensive. Here are the first three of the postcards. 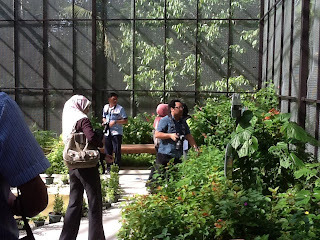 I was away in St Petersburg, Russia when the Minister of Culture, Youth and Sports officially opened the Butterfly Garden at the Tasek Merimbun Heritage Park. I had known about the park project ever since I joined the Ministry in October 2011 and I am really happy that it is finally open. For those of you who want to go there, all you have to do is drive all the way to Tasek Merimbun or if you want more information, call the Butterfly Centre at 4269179. The following is Borneo Bulletin's reporting of the opening of the Butterfly Garden. Wednesday, 4th July 2012, Bandar Seri Begawan - The newly opened Butterfly Garden, which is part of the Tasek Merimbun Heritage Park and located close to the Tasek Merimbun Gallery Hall, provides visitors the experience of witnessing the interesting interaction between butterfly species and the shrubberies surrounding them, which is symbiotic to their lifecycles. 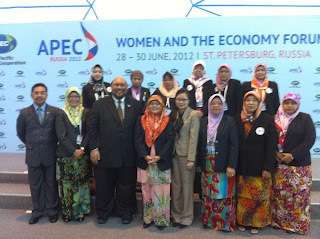 This is the complete Brunei Darussalam delegation that attended the APEC Women and the Economy Forum which was from 28th to 30th June 2012 at St Petersburg, Russia. This Brunei Darussalam group is actually made up of the official Ministry of Culture, Youth and Sports delegation and the Brunei Women Business Council. The delegation is led by Datin Paduka Hajah Adina, the Deputy Minister of Culture, Youth and Sports.